The board of directors of Raytheon Company has elected General Ellen M. Pawlikowski, USAF, Retired, as a director, effective immediately. Pawlikowski, 61, retired as Commander, U.S. Air Force Materiel Command, Wright-Patterson Air Force Base, Ohio, on September 1, 2018. During her command, she executed the critical mission of warfighter support through leading-edge science and technology, complete life cycle weapons systems management, world-class developmental test and evaluation, and depot maintenance and supply chain management. In commenting on the appointment, Thomas A. Kennedy, chairman and CEO of Raytheon, said "Ellen is widely recognized for her leadership in the U.S. science and technology community. Her distinguished career put her at the forefront of advanced technology, acquisition and national security policy in support of our nation's security, areas that will serve our company well as we further align to the National Defense Strategy and execute our global growth plan." Pawlikowski entered the U.S. Air Force in 1978 through the ROTC program at the New Jersey Institute of Technology. Her career has spanned a wide variety of technical management, leadership and staff positions, including command at the wing and center levels. She has served as Director of the Acquisition Management Office for the Assistant to the Secretary of Defense for Atomic Energy, and as Deputy Assistant to the Secretary of Defense for Counterproliferation, Office of the Secretary of Defense. Her leadership assignments included Program Director of the Airborne Laser Program; Commander of the Military Satellite Communications Systems Wing; Deputy Director of the National Reconnaissance Office; Commander of the Air Force Research Laboratory; and Commander of the Space and Missile Systems Center. Prior to her most recent Command, Pawlikowski was the Military Deputy, Office of the Assistant Secretary of the Air Force for Acquisition, based in the Pentagon. Pawlikowski's major awards and decorations include the Masters Space Operations Badge, the Air Force Master Acquisition and Financial Management Badge, the Office of the Secretary of Defense Identification Badge, and the Headquarters Air Force Badge. Among her many decorations, Pawlikowski is the recipient of the Distinguished Service Medal with one oak leaf cluster, the Defense Superior Service Medal with two oak leaf clusters, the Legion of Merit, the Defense Meritorious Service Medal and the Meritorious Service Medal with two oak leaf clusters. Pawlikowski holds a Bachelor of Science degree in chemical engineering from the New Jersey Institute of Technology and a PhD in chemical engineering from the University of California, Berkeley. She is a graduate of the Squadron Officer School at Maxwell Air Force Base, Alabama, the Air Command and Staff College at Maxwell AFB and the Industrial College of the Armed Forces at Ft. McNair, Washington, DC. 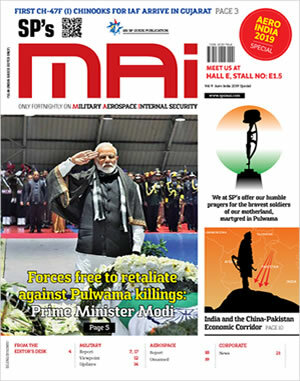 SP's MAI, A fortnightly publication dedicated to military, aerospace and internal security issues. The fortnightly covers new technologies; market information; security policies etc.